Tom Dixon’s Design Research Studio has completed its first American hospitality project and it doesn’t disappoint. Named Himitsu (the Japanese word for ‘secret’), the jewel-box cocktail lounge, which can only be entered first by reservation, then with an email passcode, followed by an iris scanner, is bringing top-of-the-line exclusivity to Atlanta. Aesthetically, the 60-seat bar evokes the clandestine nature of the American Prohibition with the careful intricacy of Japanese mixology. Realised in a moody palette of rich textures and colours, the lounge combines pre-existing features like exposed industrial structures with smooth concrete panels, leather banquettes and an illuminated copper bar that appropriately shines the spotlight on the cocktail-making process. Dixon’s Melt pendants hang artistically overhead, while smoked mirror glass and marble tabletops, Scoop armchairs and shiny Etch tea light holders complete the elegant setting. 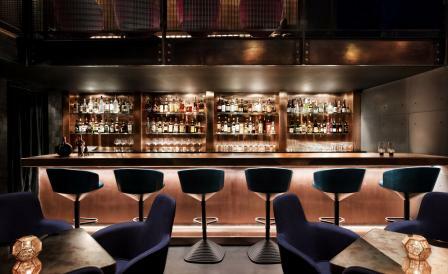 With a drink menu co-created by Shingo Gokan, director of the cult New York City bar Angel’s Share, we predict that once there, visitors are most likely going to be staying awhile.